Fresh allegations have been raised against Police Scotland's counter-corruption unit, including a claim of officers attempting to pervert the course of justice. Chief Constable Phil Gormley told Holyrood's justice committee that 25 complaints, totalling 108 allegations, were lodged in the past seven years. And he said one new criminal complaint recorded in the past three months was currently being investigated. Files on the other cases are closed. Mr Gormley said the newest complaint, including an allegation of attempting to pervert the course of justice and 11 non-criminal allegations, is "currently the subject of investigation". The chief constable has previously called in Durham Constabulary to review complaints made against the unit, and Holyrood's justice committee has also been investigating the squad. MSPs started looking into the unit after it emerged officers had broken spying guidelines while investigating a journalist's sources over stories involving a murder case. 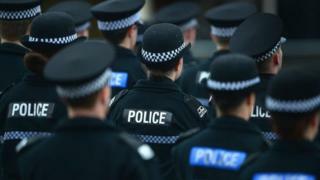 HM Inspector of Constabulary in Scotland Derek Penman said the squad was "below standard", making dozens of recommendations for improvement, while a judicial tribunal found it had acted "unlawfully". Mr Gormley wrote to the committee detailing complaints against the unit between April 2009 and July 2016, with 25 complaints totalling 108 allegations listed. Over that period there have been criminal allegations against officers relating to the data protection act and attempting to pervert the course of justice. Many of these relate to the "legacy" regional forces, prior to Police Scotland being set up. The data protection claims were reported to the Crown Office, but no proceedings were initiated by prosecutors. A number of misconduct allegations were also made against members of the team, including neglect of duty, wilful or careless falsehood and discreditable conduct. These resulted in "corrective advice" being given on a number of occasions, while "management action" was taken against officers in two cases, among the lowest-level sanctions available to the force. Green MSP John Finnie, a former policeman and member of the committee, said he was "surprised" at the low levels of disciplinary action imposed in many cases. He said: "These are by their nature serious matters, in a unit which should be the very essence of propriety." A series of investigations have been conducted into the actions of the counter-corruption unit. The Interception of Communications Commissioner ruled in November 2015 that their actions while attempting to find the source of a newspaper story about the investigation into the murder of Emma Caldwell "could properly be seen as reckless". An Investigatory Powers Tribunal later ruled that one former officer whose communications were intercepted as part of the probe should be paid £10,000 in compensation. Then-Deputy Chief Constable Neil Richardson told Holyrood's justice committee that rules had been broken due to a "misjudgement" by an experienced officer. Mr Penman's review said information-handling processes at the unit were "significantly different from national standards for source and information evaluation, and fell below the standards I would have expected". MSPs were also informed that a disc containing CCTV evidence deemed important to the case was missing for some time, before it was eventually found in an officer's locker. Mr Gormley subsequently called in Durham Constabulary to investigate "matters arising from a breach of communications data protocols".